What Is Retro Style Furniture? While you might often hear the phrase "That's so retro!" referring to furniture, it's tricky to distinguish what that actually means. The term "retro" is less specific than other furniture styles like "mid-century modern" or "art deco." Retro tends to refer to something that is culturally outdated or aged in a style that has since come back in style. Retro style often comes down to a personal choice. It can be attractive for its own sake, attractive as nostalgia, or simply appreciated because it is deliberately kitsch. In most cases, retro furniture belongs to or has the look of having been made in the decades between the 1950s and the 1980s. When designers, manufacturers, and customers speak about retro furniture, they are often referring to a style of furniture that looks back with nostalgia and pays homage to styles that were popular in the past. Namely, retro furniture was popular in the decades of 1950s, 1960s, 1970s. Recently, the industry has added the 80s to the list. You may find newly made furniture that was produced to have a retro look. Retro implies furniture from the recent past and retro furniture pieces are not considered antiques. For some, retro can evoke negative emotions in reference to trendy choices that were popular in the past, but not so popular in modern times. What Is Retro Furniture, Exactly? Retro style can be whimsical; it can allude to pop-culture and even be tacky or kitschy. It can have nods to trends in pop culture, fashion, graphic design, natural resources, or current events. This is what retro furniture is; it's anything but classic. The 1950s is the first decade of what most consider the start of retro furniture. The furnishings from this decade feature the growing influence of modern furniture. The change to modern furniture showcased a change in styles. Pieces became much sleeker and slender, with a more modern profile. In addition to the furniture style change, coverings and decorations became more modern as well. Fabric and wallpapers stood out with bold graphics and bright patterns. Finally, new materials began to be used for furniture, including Formica-topped tables and chrome bar stools. Moving through the decades, the 1960s style brought a whimsical style to modern furniture. This whimsy impacted the structure, patterns, and style of furniture and accessories. Bright, psychedelic patterns and bold bursts of color were mainstream. The sleek and low style of the 1950s were still popular, but trendy furnishings such as one-piece molded or blow-up chairs were quite popular. 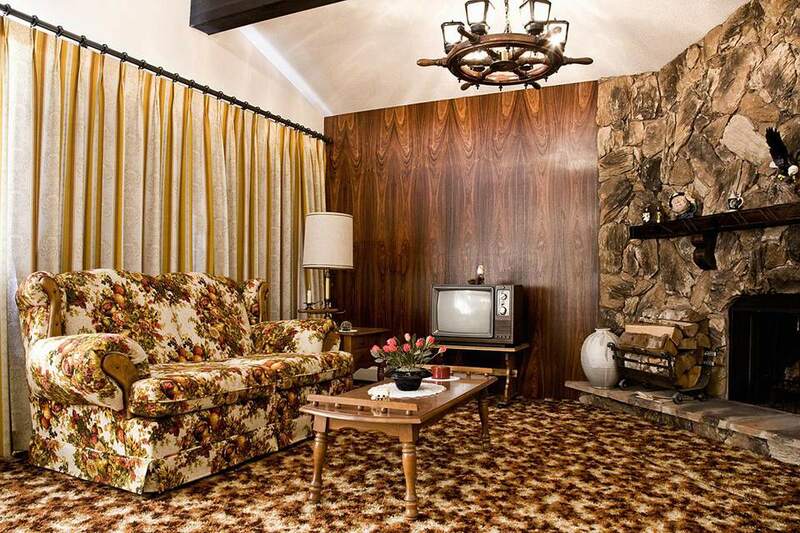 A change from sleek to bulky furniture took place in the 1970s. The everyday slender styles moved to a bigger, bulkier, and chunky style of furnishings. Additionally, the color palette was dominated by earth tones, which became quite popular in this decade. Avocado greens, harvest golds, oranges, and earthy browns dominated the color palettes of furniture and accompanying decor. As for the 1980s, that was when art deco heavily influenced the decorating style, as did South Western motifs. Country styles were also popular. Teal and mauve, colors reminiscent of the Southwest, are two colors that were popular in most of the styles, which included patterns ranging from geometrics to florals. Mirrors and mirrored furnishings, like sideboards or dressers, were also a popular feature of 1980s furniture. In a nutshell, even though these furniture and interior decor styles were diverse, they all fall under the umbrella of being a retro style. Today, you'll see nods to a wide range of retro styles in modern collections. For most collectors, retro furniture can be considered vintage, but not antique. A common classification for antique furniture is anything 100 years or older. Vintage furniture is considered anything under 100 years old and refers to furniture made in the 20th century. Of course, these are just labels and do not have any agreed upon terms by collectors or buyers. Authentic retro furniture can be found at some antique shops, through online sellers, or local garage sales. If you can find a garage sale at a very dated house or owners who have lived there for a long time, there's a good chance you will come across some retro-style furniture. The beauty of retro is that it's all subjective. For many people, the kitsch factor of the furniture is the appeal, so it truly aligns with the saying "beauty is in the eye of the beholder."